The Finals are always difficult affairs to predict when it comes to Champions League betting. When the stakes are so high and the pressure is so intense, these games can be decided by which of the two teams does the better job of handling the occasion. That is not to say it is impossible to make informed predictions pre-event, though, and ahead of the 2018 showpiece on Saturday there is one particular forecast that can be made with a degree of confidence: this is unlikely to be a low-scoring encounter and should prove thrilling for anybody planning to place a bet on the event. Both Real Madrid and Liverpool, it is fair to say, are stronger going forward than they are at the back. The defending champions shipped seven goals in their six group games – not a disastrous amount but more than most of the fellow favourites – and almost allowed Juventus to mount a stunning turnaround by conceding three times in the second leg of the two teams' quarter-final. Their defensive vulnerabilities were again on show in the last four, with Bayern Munich finding the back of the net in both legs and creating enough chances to be able to consider themselves unfortunate to not be spending this weekend in Kyiv. Can Liverpool Achieve What Bookies Consider Improbable? Liverpool have also been guilty of some poor defending at times during the 2017/18 campaign, although their record in the Champions League is rather good, leaving them at 2/1, albeit longer than Madrid, with top football betting sites to win this year. Three of the six goals they conceded in the group phase came during a second-half collapse against Sevilla, but Jurgen Klopp’s charges tightened up thereafter: after keeping back-to-back clean sheets against Porto in the round of 16, they only let in one goal in two games against English champions Manchester City in the quarter-finals. The mid-season arrival of Virgil van Dijk has led to a marked improvement in the Reds’ resolve and solidity, but there is still a sense that this is a team who can be vulnerable at the back if opponents are able to break through their initial line of pressure. On the flip side, though, it is only fair to recognise that both sides are brilliant going forward. Liverpool have blown numerous teams away in domestic and European competition this term, while Madrid possess some of the best attacking players in Europe and a midfield which excels at supplying the ammunition. 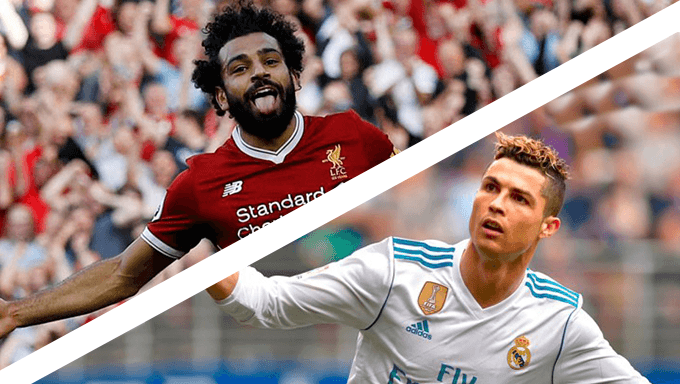 Football betting fans could therefore be treated to an open, entertaining match, with neither Madrid nor Liverpool possessing the ability or inclination to play cautious football on the back foot. With all that in mind, the goalscorer market looks particularly interesting here. Unsurprisingly, Cristiano Ronaldo is the 16/5 favourite with 888sport to break the deadlock at Kyiv’s NSC Olimpiyskiy Stadium, having already scored a ludicrous 15 goals in his 12 appearances in this season’s edition of Europe’s foremost tournament. Mohamed Salah, Liverpool’s chief threat in the attacking third having notched 45 goals in all competitions for club and country this season, can be backed at 23/5 with the same bookmaker. Of the two leading contenders, the Liverpool forward looks to be a better bet than his Madrid counterpart. That is not to say Salah is a superior player to Ronaldo, but it is easy to imagine the Premier League side flying out of the blocks and making a fast start to this game. Madrid have successfully weathered plenty of storms before and will hope to gradually get a foothold in the match, but the energy and dynamism of Klopp’s team may cause problems early on. An early goal could be crucial to Liverpool’s hopes of emerging victorious in Kyiv, and Salah – despite the longer odds available on his attacking colleagues Roberto Firmino (13/2 with BetBright) and Sadio Mane (7/1 with Karamba) – represents good value at such a price. The last goalscorer market is also worth considering, even if it is generally harder to predict than the first. It would be wise to look towards a Madrid player who will probably begin the game on the bench here, with Gareth Bale one option at 6/1 and Lucas Vazquez a tempting alternative at 9/1 (both 888sport). Liverpool do not possess the same strength in depth as their opponents – it is difficult to envisage a player like Danny Ings matching the contributions of a Bale, Vazquez or Marco Asensio – and could tire as the game goes on, so one of the above los Blancos options looks best. Elsewhere, bet-at-home offer 7/2 on Ronaldo to score twice and 9/2 on Salah to bag a brace. One of the two may be appealing as more of an outside punt.